The reactivity of different atoms in organic chemistry reactions can be compared and derived by understanding the periodic table and being familiar with its trends. 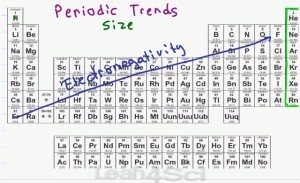 This video gives you a brief overview of the table with a heavy focus on trends required in organic chemistry including size and electronegativity. This is Video 2 in the Intro to Orgo Video Series. Click HERE to watch the entire series. OMG!!!!! you are really really really good with explaining what organic chemistry is!!!!!! Leah! You rock! You are a gifted science communicator.